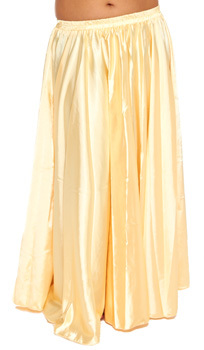 Shimmering, glamorous, and comfortable, this full circle light gold satin skirt is suitable for all styles of belly dance. A perfect staple for your belly dance costume wardrobe! Made of soft polyester. I love the color of the skirt! I usually prefer gold over silver, but this goes with both silver and gold costumes IMHO. Very pretty color and looks fabulous with gold top and belt.